Tom Friedman’s new book’s basic thesis: now everyone on the planet is living in a simultaneous age of accelerations of changes in technology, globalization and planet earth and we all are challenged in how we can and will respond to these changes. After summarizing the major points of the book, the conclusion will offer some critical comments. Most of the book describes those changes, but nowhere is there an express “guide to thriving” in this age. Instead the reader has to pick up recommended habits and changes that are sprinkled throughout the book. Here is what I assume are the elements of such a guide. Understanding the Accelerating Changes. This is Part II of the book. Increasing technology emphasizes developments in artificial intelligence and global dissemination of these improvements. Increasing globalization includes “trade in physical goods, services and financial transactions” and “the ability of any individual or company to compete, connect, exchange, or collaborate globally.” Increasing changes to planet earth include climate change, reductions in biodiversity, deforestation, biogeochemical flows, ocean acidification, overuse of freshwater, atmospheric aerosol loading, introduction of man-man chemicals and materials and increasing human population. Understanding the Effects of These Changes. This is supposed to be the primary focus of Part III of the book. The major one I found is Friedman’s assertion that there are now international inversions: allies can kill faster than enemies; “enemies” can pose greater risks by weakness rather than strength; there is a rising risk of frail states becoming failed states; and jihadists are “super-empowered breeders” of disorder or “breakers.” Most of this Part instead discusses possible responses to the accelerating changes and effects and his conclusion that “we have no choice but to learn to adapt to this new pace of change” (p. 198). Identifying and Implementing Responses to These Changes. In addition, nations need to learn and adapt, to be agile and adopt heterodox, hybrid, entrepreneurial, experimental measures (Pp. 298-325) and to reverse centralization of governments and increase their decentralization, and the U.S. with its federal structure is designed to do just that. (Pp. 325-27) The last point is repeated in Chapter 7 (P. 201). The book, in my opinion, was very poorly organized and edited. And it suggests that the U.S. responses to the accelerations should rest on the shoulders of thousands of local governments while inconsistently compiling a long list of things the federal government should do, many of which appear to be unrelated to responding to the accelerations. After a rather manic discussion of this book on the Charlie Rose Show last November, Friedman made a more effective presentation last December at Minneapolis’ Westminster Town Hall Forum. Friedman, Thank You for Being Late: An Optimist’s Guide to Thriving in the Age of Accelerations Farrar, Straus & Giroux, new York, 2016). Ip, The Economy’s Hidden Problem: We’re Out of New Ideas, W.S.J. (Dec. 6, 2016)..
[3[ Here are two of the many reviews of the book: Micklethwait, The Message of Thomas Friedman’s New Book: It’s Going to Be O.K., N.Y. Times (Nov. 22, 2016); Vanderkam, Everyone Has an App Idea, W.S.J. (Nov. 21, 2016). Unsurprisingly Friedman uses some of the book’s ideas in his New York Times columns; here are two such columns: Dancing in a Hurricane, N.Y. Times (Nov. 19, 2016); From Hands to Heads to Hearts, N.Y. Times (Jan. 4, 2017). Charlie Rose Show, Tom Friedman (Nov. 21, 2016); Westminster Town Hall Forum, Tom Friedman (Dec.13, 2016). Now based in Montgomery, Alabama, Bryan Stevenson is conducting amazing advocacy for racial justice in many different ways: as an attorney for individuals who have been victimized by the U.S. criminal justice system; as the founder of a non-profit human rights organization (the Equal Justice Initiative (EJI)) devoted to those causes; as an author and speaker; and as the creator of various ways to honor his predecessors who strove for justice and the victims of injustice. Let us review these ways in which Stevenson demonstrates his advocacy after looking at his biography. He was born in 1959 in Milton, Delaware and grew up in a poor rural community. Attending a “colored school” for his early years, he graduated from a racially integrated public high school and then Eastern College (now Eastern University), a Philadelphia “Christian university dedicated to the preparation of . . . students for thoughtful and productive lives of Christian faith, leadership and service.” He then attended and obtained a J.D. degree from the Harvard Law School; and a Masters in Public Policy degree from Harvard’s John F. Kennedy School of Government. Stevenson is an attorney and the Founder and Executive Director of EJI, which specializes in advocacy for children in adult prisons, death-row inmates, prison and sentencing reform and combating race and poverty (. 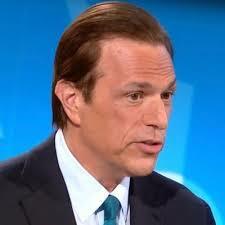 He also is a Professor of Clinical Law at NYU School of Law. In 2015 EJI attorneys won the release of innocent people on death row or in prison for life. They also were successful in obtaining new trials for people illegally convicted and relief for those unfairly sentenced. They have documented and challenged abusive conditions of confinement in state jails and prisons. They have continued to fight against prosecution of children in adult courts and to obtain new sentences for individuals who have been sentenced to life in prison for crimes committed when they were children. EJI’s work does not end when a client is released from prison. It provides them with re-entry assistance, including housing, employment, training and support. Its Post-Release Education and Preparation Program has been recognized as a model for such programs by various state officials. Stevenson’s 2014 best-selling book, “Just Mercy: A Story of Justice and Redemption,” provides interesting accounts of some of the significant cases in which he and EJI have been involved to provide context for a general discussion of particular problems in the American criminal justice system. For example, Chapter Sixteen, “The Stonecatchers’ Song of Sorrow,” opens with brief discussions of Stevenson’s 2010 victory in the U.S. Supreme Court, when it decided that it was unconstitutional to impose life sentences without parole on children convicted of non-homicide crimes, and in 2012 when the Court held the same was the case when the crime was homicide. The chapter’s footnotes provide citations to these Supreme Court decisions and other mentioned cases. Chapter Twelve, “Mother, Mother,” is another example. It recounts the trial and unjust conviction of a mother for murdering her stillborn child and sentenced to life without parole. Stevenson and EJI then entered her case and eventually obtained her release from prison. This case is then used as a platform to discuss the many problems created by incarcerating women with more details in footnotes. The book also tells of instances in which Stevenson is touched, emotionally and spiritually, by clients who are in prison. In addition, the book concludes with the “Author’s Note,” in which Stevenson seeks to recruit others to the cause of racial justice, He says, “there are endless opportunities for you to do something about criminal justice policy or help the incarcerated or formerly incarcerated.” An invitation then is extended for the reader to contact EJI for more information. This book has received great reviews, has been a New York Times Bestseller and has won the Andrew Carnegie Medal for Excellence, an NAACP Image Award and the Dayton Literary Prize for Nonfiction. 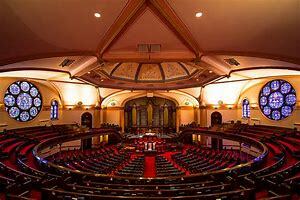 A prior post mentioned Stevenson’s then forthcoming presentation at Minneapolis’ Westminster Town Hall Forum. I attended this event even though I had never heard of him and thought his presentation would be a legal analysis of the changes needed in the American criminal justice system. Instead it was an emotional, passionate call for such reform and more of a sermon than a legal discussion. At the halfway point, the moderator, Rev. Timothy Hart-Andersen, said that in his many years as the moderator of the Forum he had never heard such a moving presentation. Over the last four years EJI has published major reports about the domestic slave trade, Slavery in America; and racial lynchings, Lynching in America; its third report was released in late 2015:The Anti-Civil Rights Movement. Excerpts from all of these reports are provided in EJI’s educational 2016 Calendar. For example, the month of October focuses on “Racial Terror Lynchings” with a large photograph of a crowd watching an 1893 Texas lynching and with this comment on October 5th: “1920: A mob lynches four black men in Macclenny, Florida, seizing three from the county jail and shooting the fourth dead in the woods.” EJI also has produced a film, From Slavery to Mass Incarceration. In addition, EJI has erected historic markers about the domestic slave trade in its home base in Montgomery, Alabama and is working on a national memorial in the city about American racial inequality and lynchings. Its first historical marker about Lynching in America recently was erected in Brighton, Alabama pursuant to a plan to place such markers at every lynching site in the country. EJI’s office building in Montgomery is the site of a former slave prison and close to the city’s slave market. In late 2016 it plans to convert part of its building to a museum about the history of racial inequality in America and the connections between slavery and mass incarceration. EJI also uses its building to host programs and presentations about its work and the need for reforming the criminal justice system while similar presentations are made by its staff at colleges, universities, churches, community groups, high schools and conferences. An insight to such programs has been provided by Jim Wallis, the leader of Sojourners, a Christian social justice organization, who along with 50 other faith leaders attended a two-day program at EJI in December 2015. Stevenson emphasized to this group these preconditions for reforming the American criminal justice system: (1) proximity to those most impacted by the system; (2) changing the narrative; (3) replacing hopelessness with hope; and (4) committing ourselves to uncomfortable things. What an amazing human being! What amazing efforts for social justice! I give thanks to God for this amazing servant! As a student of history, economics, political science, law and other humanities courses at six colleges and universities and as an instructor at three such institutions, I have participated in different ways of instructing and learning such bodies of knowledge and skills: college and university lectures, other lectures; seminars, research and writing; tutorials; the Socratic method; and role-playing. Similar methods were used in my practice as a litigating attorney and now as a blogger and ordinary citizen. Underlying all of them, of course, are reading and studying. Here are a septuagenarian’s lessons in life-long learning. This is “hard work” for the students, Worthen adds, requiring them “to synthesize, organize and react as they listen.” Indeed, students need to be taught how to listen, and lecture courses are exercises in “mindfulness and attention building.” This skill cannot be assumed, but must be taught. One way of doing so, in Professor Cummins’ classes, is to assign one student in each session to present a critique of her argument at the subsequent small discussion section. This is enhanced, Worthen argues, by requiring the students to take notes by hand, not by typing them into a computer. The former makes it impossible for them to make verbatim transcripts of the lecture, but instead to synthesize as they listen. That may be true, in my opinion, when the lecturer does not provide the students or audience with an outline of the lecture. Worthen also recognizes the utility of combining a large lecture session with small discussions sections and thereby obtain the reactions and comments of the students. My memories of my first exposure as a student to lecturing 58 years ago as a freshman at Grinnell College are fuzzy at best, but I do not recall being provided with tips on how to take full advantage of this form of instruction. I now wish I had been told how to listen, to be mindful and to synthesize as I listened. I wish I had had a professor assign one student in each session to present a critique of the lecture’s argument at the next class session. Of course, then all notes of a lecture were handwritten. In addition, I was a lecturer when I taught a course on the American Civil Law System at Grinnell while on sabbatical leave from my law firm, when I was a Practitioner in Residence at the University of Iowa College of Law, when I was an Adjunct Professor at the University of Minnesota Law School and when I was on the faculty of various continuing legal education courses while I was a practicing lawyer. That experience required me to review the material to be covered, to conduct any additional research I deemed necessary, to determine the main points to emphasize, to construct an outline for what I wanted to cover in the lecture and, in some cases, to prepare a PowerPoint presentation for use at the lecture. All of us obtain information and are educated, or not, in other oral presentations throughout our lives. I think of major political speeches like the State of the Union and Inaugural Addresses; other speeches at public events; and sermons at churches. When, for example, I listen to speeches or presentations at the Westminster Town Hall Forum, I sometimes take handwritten notes and submit proposed questions for the moderator to ask the speaker. Later I also can go to the Forum’s website to re-listen to the speech. I also have written blog posts about some of these presentations. Another recent source of lectures for me is those offered by the Osher Lifelong Learning Institute (OLLI) of the University of Minnesota. 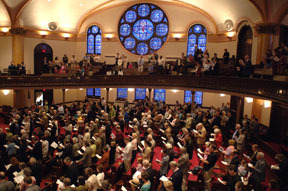 For sermons at Westminster Presbyterian Church, I sometimes make handwritten notes of some of the points on the church bulletin in my hands while the morning prayer, hymns and choral anthems usually emphasize some of the sermon’s main points. I also have found that I learn more about the sermon’s lesson by reading its text when it is subsequently posted on the church’s website and by reading and reflecting on the Scripture passages for the sermon; additional insight is often providing by writing a blog post about a sermon. My best educational experience at Grinnell College was taking the Political Economy Seminar my senior year with nine other students and with faculty from the economics, history and political science departments. We read important books in the field, not textbooks, and wrote and presented our papers on the former for discussion by all. The Washington Semester at American University in the Fall of 1959 provided another type of seminar experience as a group of students from all over the U.S. met with politicians, government officials and others to learn about the operations of the U.S. government and political process. I also organized and led a liberal arts seminar for lawyers at Grinnell in 1984. After reading various materials, we gathered at the College to discuss American legal history, alternative dispute resolution (ADR), jurisprudence and the lives and challenges of being humane judges and lawyers. Our leaders were a federal appellate judge, a national ADR scholar, an American history professor, a jurisprudence professor and a practicing lawyer. Being in a book group, for me at Westminster Presbyterian Church, is another seminar experience for groups of 12 or smaller. Reading an assigned book and then gathering for a discussion of the book led by one of the group usually leads to a greater understanding of the book and its issues. For example, I recently led my group in discussing David Brooks’ “The Road to Character” after I had written about the book in this blog. During my student years I conducted factual and other research about various subjects and in the process learned a lot about those subjects as well as research skills. The task of then reducing that research into a paper on the subject provided more learning about the subject plus the process of writing such papers. Later as a practicing lawyer these skills were further developed with the aid of the legal process for obtaining evidence in lawsuits, including the examination of witnesses, and the writing of briefs and other legal papers under rules for their contents and length. The student research paper I best recall was at American University. The topic was how political interest groups participate in important cases in the U.S. Supreme Court and more specifically in contempt-of-congress cases in that court. I identified such cases, read the Court’s opinions in the cases, interviewed staffers at the relevant congressional committees (especially the House Un-American Activities Committee) and at the relevant political interest groups (especially the American Civil Liberties Union and the American Association of University Professors) and then spent a lot of time at the Supreme Court’s Library reading the briefs in the case, including those from the ACLU and the AAUP as amici curiae (friends of the court). The paper summarized this research and conclusions. My enjoyment of research and writing continued as a practicing lawyer, both in my work as a lawyer and as a putative scholar. For example while at Harvard Law School for a short summer course, I spent time in its library doing research about Joseph Welch and Edward Burling, both prominent attorneys who were graduates of that Law School and of Grinnell College, and interviewing attorneys at Welch’s Boston law firm, about his representation of the U.S. Army in the McCarthy hearings of 1954. Later I wrote articles about both of them for the Grinnell Magazine  and even later with excerpts from the Welch article in this blog. A similar process was involved as a law student in researching and writing comments for the law review and as a lawyer in writing briefs. Grinnell College recently has enhanced its use of research and writing as an educational method by adding a public website, The Grinnell Post, that hosts student essays about current events, public debates, and issues of interest to the Grinnell community. Its mission is to allow students to share their work in a public forum and foster conversations with a diverse readership and solicit their comments and criticism. Another Grinnell effort to incorporate digital technology in the liberal arts is a website, Ashplan, initially devoted to James Joyce’s Ulysses. It seeks to foster the inheritance of classroom culture; that is, it forges connections among students studying the same material at different times, allowing new students to benefit from, remix, and add to the work of their predecessors. As discussed in a prior post, the tutorial was the primary mode of undergraduate education at Oxford. During each week of the three terms of the academic year, I would have two tutorials, usually with only one other student and the tutor and sometimes only by myself with the tutor. The assignment was always in the form of a question with the tutor’s suggestions of books and articles one should read. As a result, most of my time each week at Oxford was spent in the university libraries reading those sources and other relevant materials, figuring out how I would answer the assigned question and writing an essay setting forth that answer and analysis. Then I would see the tutor again and read my essay for critiquing and discussion. I loved the independence of this system and being “forced” to come to a conclusion on an issue and to construct my own analysis and documentation for my conclusion. This was exactly the skill that was tested in Oxford’s university-wide examinations at the conclusion of my student-years, as also discussed in a prior post. Grinnell College now has a First-Year Tutorial for all freshmen in groups of about 12 students that are led by “faculty members . . . from all academic departments . . . in more than 35 topics.” For the Fall of 2015 these include “Crisis, Liberation, Justice, and Leadership;“ “Racism: Color, Culture, Class; “ and “The Origins of Capitalism.” Every tutorial emphasizes writing, critical thinking and analysis, and oral presentation and discussion skills. The tutorial professors also serve as the advisers to their tutorial students until they declare a major field of study. After the treasured independence of the Oxford undergraduate experience, I initially was shocked in my first weeks in the Fall of 1963 as a student at the University of Chicago Law School. Now I was in large classes with daily assignments of certain pages in our large casebooks. The professors did not lecture. Instead they cross-examined individual students, one-by-one, about what the holding of a particular case was and what the result should be in a hypothetical case. We were being taught, we were told, how to think like a lawyer. This method clearly taught you how to read a judicial opinion very carefully (and very painfully and slowly during that first semester of law school), to analyze that opinion to determine what its holding was and to think about the arguments that could be raised in similar, but different, hypothetical cases. Then in class you had to learn how to think on your feet and respond to questions from the professor as you would later do as a lawyer when questioned by a judge. Reading and analyzing constitutions, statutes and regulations are also important for a lawyer, but I do not have clear memories of how that was done in my law student years. Of course, many judicial opinions concern judicial interpretations of such materials, and the overall law-school emphasis on reading and analyzing judicial opinions covered that methodology. Learning how to do legal research and write legal briefs is another important part of law school. In addition, being a member of a law review staff and editorial board gives experience in writing and editing articles about legal topics. Participating in moot courts and playing the role of a lawyer making an argument to a court is another prominent method of legal education. I did not take advantage of this opportunity in law school as I was busy working on the law review doing legal research and writing and editing articles for the journal. I, however, employed this method when I taught for one semester at Grinnell while on sabbatical leave from my law firm. I acted as a trial court judge hearing arguments by students as lawyers on a motion to compel production of a college tenure committee records in a hypothetical lawsuit brought by a professor against a college for denial of tenure. A different kind of role playing in that course was having the students, in lieu of a final examination, play the role of a justice of the Iowa Supreme Court and write an opinion deciding a case after reading the briefs in the case along with my memoranda summarizing some of the legal issues and after hearing the case argued before the actual Court. I also used the moot-court method when I was an adjunct professor at the University of Minnesota Law School; I acted as a federal district court judge hearing arguments on a motion to dismiss a complaint under U.S. federal statutes (the Alien Tort Statute and the Torture Victims Protection Act) alleging a corporate defendant’s violations of human rights in other countries. I also acted as a judge of an immigration court to hear arguments on whether the court should grant an application for asylum by someone who allegedly had a well-founded fear of persecution in his or her home country due to political opinion or other protected ground. I used a different kind of role-playing when I was a Practitioner in Residence at the University of Iowa College of Law. In a first-year civil procedure class, I played the role of a law firm partner while the students played the roles of associate attorneys working for me as we collectively identified issues, potential arguments and additional legal research needed for preparing a civil complaint under the strictures of Rule 11’s requiring such a pleading to be warranted by existing law or a non-frivolous argument for changing the law and by evidentiary support. In such role-playing exercises, the student learns about procedural and substantive law, identification of legal and evidentiary issues and how to write and analyze briefs and make oral arguments. In my experience, this is an effective way of learning several areas of law plus the skills of advocacy, and most students appreciate these opportunities to have a taste of what it is like to be a lawyer. I am fortunate to have experienced different methods of teaching and learning from able practitioners of the different methods. I have learned in each of these settings and cannot say one is better than another. A lot depends on the size of the audience and the stage of your educational career. Seminars and tutorials require a small number of students while lectures are more appropriate, if not required, for a large number of students. I hope that I have been able to convey the same excitement of learning when I have been the instructor. Grinnell College, 1957-1961; American University (Washington Semester), 1959; University of Oxford, 1961-1963; University of Chicago Law School, 1963-1966; Harvard Law School (Summer Program), 1986; and University of Minnesota Law School, 2001. Grinnell College, 1982, 1984; University of Iowa College of Law, 1986; and University of Minnesota Law School, 2002-2010. Worthen, Lecture Me. Really, N.Y. Times Sunday Review (Oct. 18, 2015). Aaron Fichtelberg, an associate professor of criminal justice at the University of Delaware, strongly disagrees on the value of PowerPoint. Indeed, he argues that it “turns good teachers into mediocre ones and mediocre lectures into a sludge of unengaging facts.” According to him, it “forces rigidity on the content of the course and passivity onto the students.” I agree that sometimes such use is boring. But as with all of these modes of teaching, there are the good and the bad. Other opinions? 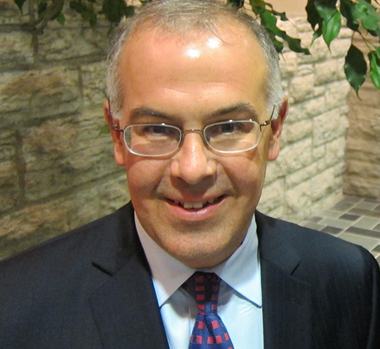 The Important Moral Virtues in David Brooks’ “The Road to Character” (May 1, 2015); David Brooks’ Moral Exemplar (May 2, 2015); David Brooks Speaks on the Role of Character in Creating an Excellent Life (May 16, 2015). Good Night, and Good Luck: The Movie’s Offstage Hero, Joseph Welch, Grinnell Magazine, Summer 2006, at 12; Edward Burnham Burling, Grinnell’s Quiet Benefactor, Grinnell Magazine, Summer 2009, at 21. Joseph Welch Before the Army-McCarthy Hearings (June 14, 2012); The U.S. Army’s Hiring of Attorney Joseph Welch for the Army-McCarthy Hearings (June 8, 2012); Attorney Joseph Welch’s Performance at the Army-McCarthy Hearings (June 6, 2012); U.S. Senator Joseph McCarthy’s Nemesis: Attorney Joseph Welch (June 4, 2012); President Dwight D. Eisenhower’s Involvement in the Army-McCarthy Hearings (June 10, 2012); Joseph Welch After the Army-McCarthy Hearings (June 12, 2012); Legal Ethics Issues in the “Anatomy of a Murder” Movie (June 12, 2012). Brooks recalled with gratitude three personal uplifting moments. One was observing his then three young children playing on a beautiful day. Another was watching women in Maryland teaching English to immigrants. The last was sitting at a luncheon next to the Dali Lama and experiencing his inner joy and laughter. These moments produced David’s overwhelming sense of gratitude to have experienced these moments of higher joy, an enlargement of his own heart and an acknowledgement that these had happened to him by the grace of God. Because issues of morals and character in western culture have been discussed by Christian theologians, his book uses their vocabulary. We need to recover and perhaps modernize that vocabulary, said Brooks, especially to recover the meaning and importance of the concept of sin. He also mentioned that many contemporary U.S. politicians feel compelled to promote and advertise themselves and as a result start to believe their own propaganda. Exceptions of politicians of modesty and honesty are former Vice President Walter Mondale, a Westminster member who was in the audience; Minnesota’s former U.S. Senator David Durenberger; and current U.S. Senator Amy Klobuchar. His book provides biographical sketches of how 10 different people in different ways created disciplines that built character. He mentioned the following six of them in his talk. Ida Stover by age 11 had lost both of her parents and then was an overworked indentured servant in another household, but at age 15 she left to be on her own, to get a job and an education. Later she married David Eisenhower, became Ida Eisenhower and raised five sons, one being Dwight D. Eisenhower. After Ike threw a temper tantrum at age 10, Ida paraphrased Proverbs 16:32 to him: “He that conquereth his own soul is greater that he who taketh a city.” In other words, the central drama of your life is fighting against your own sinfulness and weaknesses. Many years later Ike said this was one of the most valuable moments of his life that helped him to recognize his temper as a weakness and to develop techniques to prevent it from interfering with his leading others. Frances Perkins was a genteel graduate of Mount Holyoke College who found her vocation of improving worker safety by happening to be a witness to the Triangle Shirt Factory Fire in Manhattan, in which many workers lost their lives. She responded to what the world was demanding of her. Dorothy Day, a social activist, near the end of her life started to write her “life remembered,” but could not do so. Instead she “thought of our Lord [Jesus], and His visit to us all those centuries ago, and I said to myself that my great luck was to have had Him on my mind for so long in my life!” Day’s “The Long Loneliness” shows her intense self-criticism, her discovery of her vocation and her humility. It is one of Brooks’ favorite books and also of the students in his Yale course on humility. George Eliot (born Mary Anne Evans) obtained character through her love for George Lewes, and such love, according to Brooks, humbles a person, making you realize you are not in control of your own life; allows you to express tenderness and vulnerability; de-centers your self; and fuses two individuals together. Brooks advised the high school students in the audience to make the following commitments by the time they were at least in their mid-30’s: adopting an existing faith or philosophy of life; choosing a vocation; getting married; and choosing a community in which to live. Although he did not say so, these commitments may change during your life. The unnamed couple who were thus toasted were (a) Samantha Power, the U.S. Ambassador to the United Nations, the author of the award-winning book, A Problem from Hell: America and the Age of Genocide, and a former Harvard Law School Professor and (b) Cass Sunstein, a Harvard Law School Professor, an acclaimed author and a former aide to President Obama. The audio recording of the speech is available online and later the video of same will be added. . Brooks’ prior appearances at the Forum, also to overflow audiences, are also available online: “The Historic Election of Barack Obama” (Nov. 13, 2008) and “The Social Animal: Hidden Sources of Love, Character, and Achievement” (Mar. 31, 2011). The recent book was discussed in the following prior posts: The Important Moral Virtues in David Brooks’ “The Road to Character “ (May 1, 2015) and David Brooks’ Moral Exemplar (May 2, 2015). Brooks has created a website about the new book to foster readers’ comments about character. The Dorothy Day book is on the 2013 edition of the Syllabus for Brooks’ “Humility” seminar at Yale. The other books on the syllabus as well as the topics covered in the seminar make one wish to be a student again. In light of Brooks’ recent book’s not including biographical sketches of any Jewish people and his comments on that omission to a Jewish critic, it is noteworthy that the Syllabus describes one seminar session as being devoted to Moses, the “most humble man on earth;” the “Jewish formula of character building through obedience to the law;” the “way the rabbinic tradition has interpreted the struggle between internal goodness and the evil urge;” and the Book of Exodus as the reading. The Yale seminar has prompted comments by a student who was in the seminar, criticism of the Syllabus and Brooks’ defense of the seminar. Today (November 26th) Minnesota Public Radio will broadcast at Noon (CST) and 9:00 p.m. (CST) Bryan Peterson’s presentation yesterday at the Westminster Town Hall Forum, “Just Mercy: Reforming the Criminal Justice System.” It is great! Listen! Everyone needs to get closer to the poor people and the incarcerated. Everyone needs to reflect on the history of racial injustice in our country and change the narrative on race. We need truth and reconciliation on race. Everyone has to find a way to stay hopeful about changing this injustice. It is not easy. It requires a reorientation of the spirit. Everyone needs to choose to do uncomfortable things. Go inside prisons, for example. The opposite of poverty is justice, not wealth. The quality of a society is judged by how it treats the poor. Bryan Stevenson is a public-interest lawyer and founder of the Equal Justice Initiative, which is committed to eliminating bias against the poor and people of color in the criminal justice system. A professor at New York University Law School and a graduate of Harvard Law School, he argued for and won the historic ruling in the U.S. Supreme Court that mandatory life-without-parole sentences for children 17 or younger are unconstitutional. His new book, Just Mercy, profiles the lives of men, women, and children who are at the mercy of a broken criminal justice system. Stevenson grew up in Alabama. He started school in a “colored school” and only after desegregation of his town’s schools was he able to obtain a high school education. His great-grandparents were slaves, and his parents daily were subjected to humiliation because of their race. 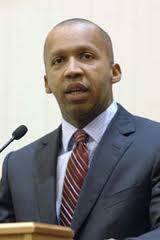 Thank you, Bryan Stevenson for inspiring and challenging us. An oral recording of the Town Hall presentation is available on the web.